Unique finish and great construction makes this a standout in any crowd. 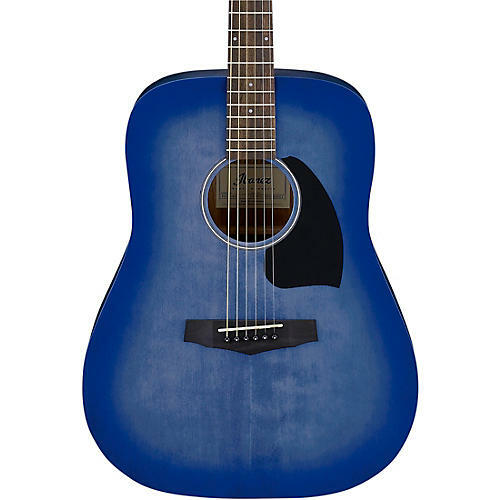 Ibanez's Performance Series, which now includes this cool blue PF18WDB Dreadnought acoustic guitar, represents a strong focus on sound quality and performance at an excellent value. With over 50 years of experience to draw from, the Performance Series models were created to give you an economical, entry-level instrument. The PF18WDB is a dreadnought body style acoustic with a spruce top, back and sides for a warm, full tone. While the open pore finish adds to the guitars natural, subtle aesthetics, it also contributes to the sound of the instrument. Thick, heavy finishes can impede the vibration of a guitar’s body, “choking” the instruments tone and projection. The light, carefully applied Washed Denim Burst open pore finish permits the wood to transfer sound more freely, optimizing vibration and allowing the guitar to realize its full sound potential. The PF18WDB also features a Chrome Open Gear Tuners, laurel fretboard and bridge with Ibanez Advantage bridge pins for improved tuning stability. Whether you play rock or the blues, this guitar will make a statement. Order today.